With outstanding image quality, the 2560 x 1440 27-inch NEC PA272W is one of my favorite displays. So I was a little discouraged to hear that it was discontinued in all its guises; MultiSync, SpectraView and SpectraView Reference. My disappointment didn’t last long however, as NEC has announced a single replacement for all three versions, the MultiSync PA271Q. Typically, there isn’t much between updates though. A new connection standard and perhaps one or two new color modes for out-of-the box color control is usually all that’s different. But, as completely new model, that’s not the case with the new PA271Q. For a start, it has a lighter weight body than the series has used previously, more in the vein of the excellent NEC EA275 UHD model. For example, the weight has dropped from a 12.6kg to a far more manageable 9.6kg. Doesn’t sound a lot admittedly, but it means you can easily move the monitor from room to room; and like the EA275 UHD, there’s even a built-in ‘handle’ in the bezel at the back. At the time of writing it’s not clear if this weight reduction is due to the new panel technology or reduced size of chassis electronics or both, but it is impressive. (Update 27/11/2018; NEC has since confirmed the reduced weight is a direct result of new panel tech and electronics). So let’s take a closer look. NEC PA271Q BK-SV (with software and NEC colorimeter). Preferred option. What is it, and why do you need it? The NEC MultiSync PA271Q is a 27-inch monitor with a 2560 x 1440 (QHD) 16:9 ratio display. That 16:9 ratio is more in-keeping with video-centric displays but if you’re using Photoshop, or a Raw editor like Lightroom or Capture One, with the tools either side of the image you can maintain a decent size image. You also have the option to switch between the photo apps and video editors without compromising “real estate”. Wide-gamut monitors like this that cover or closely the Adobe RGB color space (99% in the case of the PA271Q) are essential for accurate assessment and adjustment of color when preparing files for any print based output, such as magazines, sending images to print bureaux or even home-based inkjets. Typical standard monitors even those on fairly recent high-end iMacs (not the latest 2017 models) use the smaller sRGB color space. This is around 75% that of Adobe RGB and is limited by some green and blue hues. If you can’t see all of the colors, how are you going to make accurate color corrections to your images? Also of interest to imaging professionals is the eciRGB v2 color space. This is another space that’s suitable for assessing images intended for print as the gamut extends beyond Adobe RGB in cyan, green and red hues. Monitors like this are also recommended for editing and color grading video, though you should use a dedicated color space such as Rec.709, DCI-P3 or Rec.2100 (HLG or PQ) instead, which are all supported via selectable Picture Modes. Besides possessing a wide-gamut high-grade IPS (in-plane switching) display for wide-viewing angles with minimal color shift, the PA271Q has some other high end features that aren’t usually found on more accessibly priced monitors. It features sophisticated chassis electronics that allow you to adjust a wide range of settings for color, color temperature, black point, luminance (brightness) and gamma among others. Contrast that with others such as the high-end 5K iMac and iMac Pro which only allow you to adjust luminance (brightness) and means in short, you can’t calibrate them properly. Being able to select a wide range of parameters using the chassis electronics is essential for accuracy when re-calibrating, as color drifts over time as the display ages. This is called hardware calibration and differs from the more typical software only calibration used on lesser displays like that used on the 5K iMac. Software only calibration also uses a colorimeter but instead alters the computer’s video card output and rarely achieves the same accuracy. In both cases a profile is produced to document the values which is used by your application’s color management system to match the colors. Like other high-end models the PA271Q leaves the factory with a calibration certificate showing outstanding color accuracy. Stability and accuracy are important between calibrations, especially when frequently switching between color modes. To aid that it has an integrated color processor and LED backlight sensor that constantly checks and adjusts various settings to maintain that accuracy – in theory increasing the time between calibrations. There’s also a Uniformity function which compensates for variations in luminance and color in the panel. The effectiveness of this technology varies between make but the high end NEC panels are second to none. While it’s probably not necessary to recalibrate it immediately after unboxing, and it certainly doesn’t look as if it needs it, the PA271Q does have its own built-in calibration feature. Alternatively, you can opt for company’s SpectraView II calibration software for more control. However, SVII is a paid for extra. In both cases an optionally available colorimeter is required (but this is an essential option for color accuracy at any level). As already mentioned the PA271Q is lighter than many previous models, and is as a result much easier to move around and set-up. The stand has a good range of movement left and right and plenty of adjustment of the height, and when tilting. Another high-end feature meant for viewing vertical images is the ability to rotate the panel through 180-degrees (make sure it’s a full height first and tilted back) – so you can add the power and connection cables. Two computers can be connected simultaneously via the USB-C (input) and two, covered and uncovered DisplayPorts, shown above. 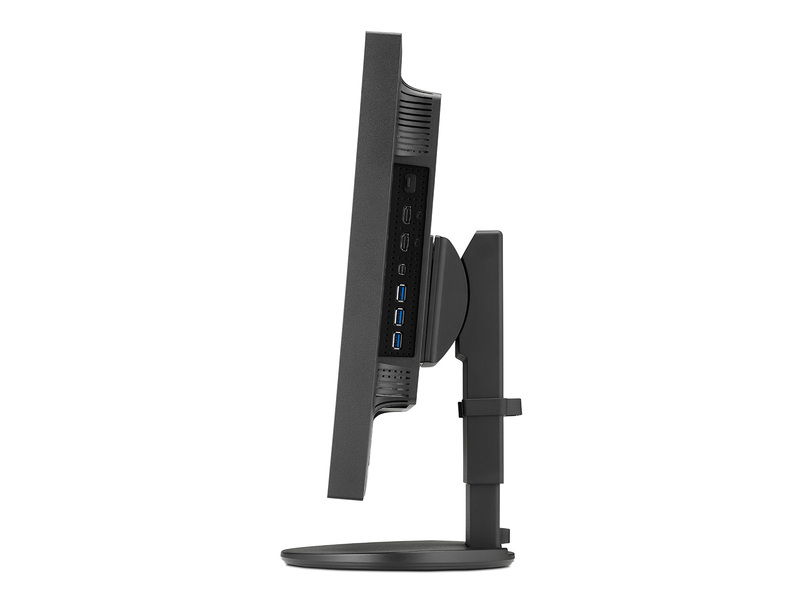 It has a thin bezel and the stand and cable management has been simplified. Presumably the weight doesn’t shift so much as previous models when raised so it doesn’t have to protrude to the rear. That makes it look smaller and means you can place it closer to a wall, freeing up desk space. On the desk, it doesn’t have the monolithic presence of its predecessor or of rivals like the Eizo ColorEdge displays. There are no DVI-D ports, they’ve been dropped in favor of two full-size DisplayPorts (DP), one IN for connection to a Mac or PC , the second is OUT for daisy-chaining a second monitor. Further future-proofing is provided by the USB-C (Thunderbolt 3) port which supports a single cable connection for video, audio and the USB hub.Cables include DisplayPort, miniDisplayPort to DisplayPort and full-size HDMI. There’s no USB-C (Thunderbolt 3) cable supplied, so if you’re using a modern Thunderbolt 3 enabled Mac such as the later 5K iMac, the iMacPro or the new Mac mini, you’ll have to get a Thunderbolt 3 (USB-C) cable (not the USB-C charging cable). Apple’s Thunderbolt 3 USB-C to Thunderbolt 2 Adaptor doesn’t support direct connection but when connected via a Thunderbolt 2 hub (actually a G-Tech G-RAID Studio) and using the supplied mini DP (Thunderbolt 2) to DP cable it worked perfectly fine. A USB-3 cable is also supplied incase additional data/control is required from the computer, especially for the built-in hub and audio – it has two small in-built speakers – if the USB-C connector isn’t used. In fact two USB upstream ports are provided to supplement the DisplayPort connections, so you can connect two computers such as Mac and PC with just one keyboard and mouse and switch between them. At the time of writing, I’ve not tried this so can’t confirm how well this works. The hub is a major plus for photographers in the studio, or even when used in an office. It’s located on the right-hand side and is easily accessible. Besides having three USB 3.1 ports for charging a phone, connection to a keyboard or card reader etc , the PA271Q has a mini DP IN port to connect a Mac (or PC) with a TB 2 cable rather than using one of the other ports underneath. In addition there are two HDMI ports for direct connection of suitably equipped PCs or cameras – the latter of which is useful for monitoring or play back of video capture or Live View. There’s also the SENS/MEM port – a dedicated USB port for the NEC colorimeter or third-party devices for the self-calibration feature. Once connected the monitor has physical power switch to isolate from the mains. This is located on the right-side and is more easily accessible than the usual under the bezel of rivals. There’s a row of touch sensitive buttons used to power on, navigate the OSD, and direct access to most-used features including the Picture Modes, though most if not all of the contents is also accessible using the free to download Multi Sync profiler app. Navigation of the OSD is slicker than most but the app is preferred for the more complex tasks. In either case, several Picture Modes allow quick access to several photo and video industry standard color spaces so you can predict what your output will look like in them. As a photographer you’re unlikely to switch between these that often, though if you’re a filmmaker you likely will. Typically, as a photographer you’ll be using the Full mode, which will use the full or native gamut of the monitor and is the most suitable with imaging editing apps in a color managed workflow. Nevertheless, you might want to check images intended for the web in sRGB and edit or playback video clips in the some of the others such as REC709 and the still relatively uncommon DCI (P3) color space. Editing video in the native gamut of the display is likely to lead to oversaturated clips. 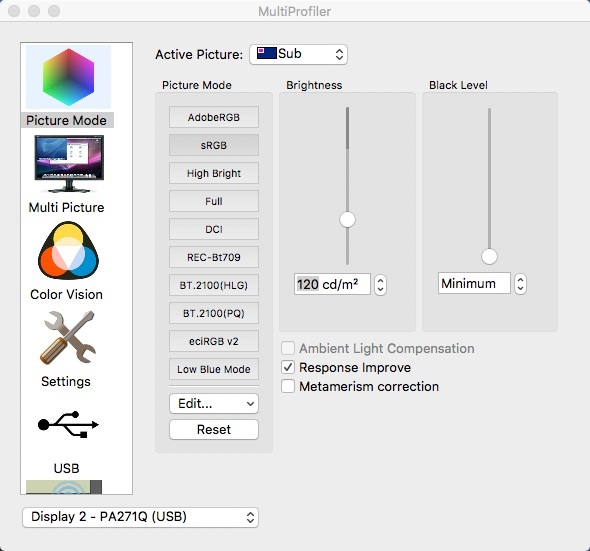 Each mode is adjustable, typically to alter the monitor’s color temperature to match the lighting that the print is intended to be viewed under and/or brightness of the ambient lighting to match the monitor. So for example if you want to drop the 160 cd/2 of Adobe RGB down to 120 cd/m2 you can do so easily as the Luminance (or Brightness) has its own touch sensitive button so is directly adjustable from the bezel. Although it’s not clear from the monitor’s documentation, when using the profiler app a ICC/ColorSync profile is generated every time it’s changed. If you want the preset modes left untouched there are several custom Picture Mode options in the profiler app which could be used instead. The free to download software is feature rich and further exploration of it is required. It may be possible to include a review of this and/or NEC’s SpectraView II profiler software at a later date. The self-calibration feature doesn’t require a computer to be attached, which is especially useful if you’re pairing it with a laptop only. However you will need a colorimeter. As far as I can tell, the auto option appears only compatible with the NEC colorimeter, available at extra cost (£TBC / $299 at B&H, including the SpectraView II software). There’s a dedicated USB SENS/MEM port in the display’s hub to the side (see above) which is used exclusively for self-calibration, which is a nice feature. I couldn’t locate my X-rite i1Pro (on which the NEC colorimeter is based) but fortunately I also have a Datacolor Spyder4, and that is compatible when used in the manual self-calibration mode. There’s no documentation to assist with this but it’s easy enough to work with. There are no target values however, and the calibration is purely a measuring exercise. In addition to this the PA271Q can be calibrated using a wide number of third-party software solutions, including that bundled with Datacolor Spyder4. That said, Datacolor has not updated their software for macOS 10.13 and thus it doesn’t have an option to select the high-end AH LED (GB-R) type backlight found on this monitor. I like the Datacolor software application, but it doesn’t automatically set the display’s settings – you have to enter them manually to as close as you can. After calibration the software measured the gamut as 99% of Adobe RGB – exactly the percentage of the space that this monitor is capable of. I didn’t have access to the SVII calibration software, which is also compatible with the excellent Spyder4 and which provides both target values and presumably automated adjustment of the display’s parameters. Unless you can access the self-calibration option though – you would be better served to make these adjustments via the SVII app as you would be able to verify the calibration accuracy before making any changes to the settings. NEC has designed the PA271Q to appeal to photographers and occasional filmmakers. Of course there are 4K and 5K panels such as those used in the 5K iMac and iMac Pro – I’ve used them since they were introduced, and I’m on my second with an iMac Pro and I’m not convinced the extra resolution is useful for determining focus accuracy. High res 4K and 5K screens tend to make everything look good, though to be fair you can use them to quickly see which are okay. For considered accuracy though you can’t beat a high-end display like that found on PA271Q and especially as this one has a superbly sharp image. Earlier models had an aggressive anti-reflection coating which imparted a grainy looking image. The PA271Q on the other-hand has a much improved coating with excellent suppression of reflections from light sources and the sharpest image of this pixel density I’ve seen. In my opinion it is superior when assessing sharpness than the latest 5K iMacs. From the Spyder4’s test data, it also has excellent color accuracy and outstanding color and luminance uniformity. Although not cheap exactly and to get the best from it you might want to consider the SVII software, the PA271Q is without doubt a superb choice. If you’re wondering if NEC are going to introduce a Spectraview variant, which includes a hood, usually an additional warranty on the backlights, SVII utility and a bump in price, you’re just going to have to wait and see. (Update, 27/11/2018: NEC has confirmed that this monitor will not be available as a SpectraView variant, however a hood, colorimeter and SVII software will be offered separately). More information about the monitor is available from the NEC display solutions website.